The Keno Brothers sale in New York offers 40 classic cars in the Rolling Sculpture auction with a quarter expecting to sell for over a million dollar. The highlight of the sale is a 1969 Ferrari 365 GTB4 N.A.R.T. Competizione, which is expected to achieve around $5 million. A 1953 Ferrari 212 Inter Pinin Farina Coupe is also expected to sell for well in excess of a million dollar. The auction features three cars that have been the mainstay of classic car sales in recent months and selling usually above a million dollars: a1955 Mercedes Benz 300 SL Coupe, a 1990 Ferrari F40, and a 1973 Porsche 911 Carrera RS Lightweight. Ferraris are usually the top cars on offer at major classic car auctions and the Keno Brothers’ debut sale in New York will be no exception. 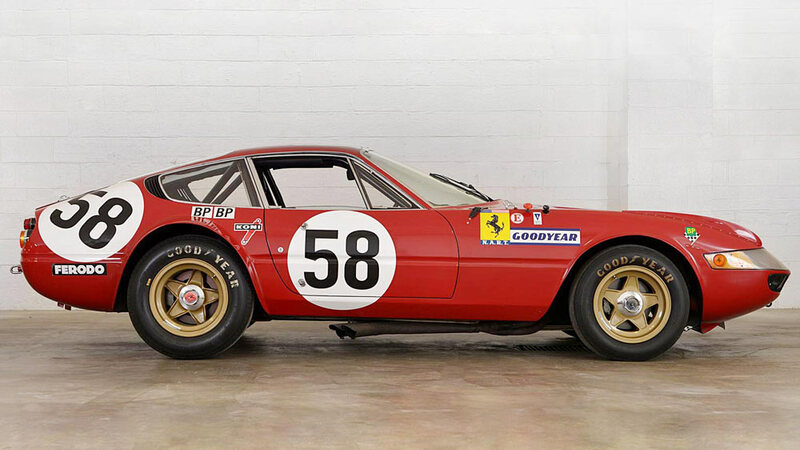 The 1969 Ferrari 365 GTB4 N.A.R.T. Competizione is offered with an estimate of $4.9 to $5.9 million. This 1969 Ferrari 365 GTB4 N.A.R.T. Competizione was fifth overall at the 1971 Le Mans 24-Hours race – finishing 8 laps ahead of the GT cars that it would be classified against at following races. The car was also successfully raced in North America in period and thus qualifies for many historical events in addition to the Le Mans Classic. The 1953 Ferrari 212 Inter Pinin Farina Coupe (est. $1.3 to $1.9 million) originally belonged to Prince Bernhard, the husband of the future Queen Juliana of the Netherlands. He had Ferrari use the chassis number of his old car on the new one to avoid import taxes. Ferrari produced around 80 of the 212 cars with only 14 using Pinin Farina coupe bodies. This was the first model for which Pinin Farina supplied coachwork for Ferrari. The 1953 Ferrari 212 Inter Pinin Farina Coupe has covered less than 28,000 km since new. The leather interior and the exterior paintwork are considered to be the original. No classic car auction these days seems complete without a 300 SL and the Keno Brothers’ sale obliges with a fine 1955 Mercedes Benz 300 SL “Gullwing” Coupe (estimate $1,275,000 – $1,575,000). This 1955 Mercedes Benz 300 SL Coupe has covered around 60,000 miles and had only four owners since new, including a recent ownership spell of four decades. It has its original black leather interior but the paintwork is a more recent, but factory-correct, Strawberry Red Metallic. With over 1,300 cars produced, Ferrari F40s are the most common Ferrari supercar on the road. In recent months, Ferrari F40s without issues have generally sold in excess of a million dollar, and like the Mercedes Benz 300 SL become a regular at classic car auctions – at least ten have been sold for over a million dollar thus far in 2015. The 1990 Ferrari F40 (estimate $1.1 – $1.6 million) has covered just more than 7,000 miles and is a matching-numbers example with significant upgrades. However, the upper estimate is perhaps a bit optimistic. The 1973 Porsche 911 Carrera RS Lightweight (estimate $1.1 to $1.5 million) is one of only 240 lightweight models produced. In recent months, several similar 911 Porsches have tested the market but very few offers have matched the sellers’ expectations. Correct specification and condition may count in the favor of the car on offer but many buyers may consider the difference from standard 911s too small to warrant the premium asked. Six further cars are on offer at the Rolling Sculpture sale with upper estimates in excess of a million dollar. Some have very wide estimates, indicating in part how some of these models sold at unpredictable prices at recent auctions. This is in part due to a larger number of cars coming onto the market once one similar car had achieved the million-dollar mark. For example, the 1968 Toyota 2000 GT on offer may be helped by being a highly original and correct example but in 2015, at least five 2000 GTs have failed to sell in excess of a million dollar. The Rolling Sculpture classic car auction arranged by the Keno Brothers will be held in New York on November 19, 2015. On offer at the auction will be 40 fine classic and collector cars – many pricy but all beautiful designs. The debut auction of the Keno Brothers, who are familiar figures in classic car circles, will be during the New York art season. It is held at the Skylight Clarkson Sq, 550 Washington St, New York.